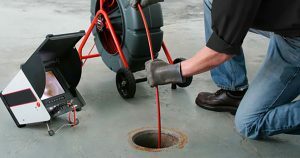 Using a video camera to inspect various plumbing lines renders a real-time visual inspection of underground sewer lines and other pipes inside your home. Master Plumbing & Mechanical makes use of this advanced technology to efficiently determine the condition of the interior of a pipe without costly, time consuming physical investigation. A flexible rod containing a high-resolution camera travels through the pipe and around corners allowing the technician to see the entire interior of the pipe, eliminating guesswork and allowing accurate diagnosis of the problem and its location. Breaks, cracks or collapse with a pipe as well as the location of the issue within the pipe. Corrosion/deterioration of a section of pipe leading to collapse and/or restriction of the flow of water and waste, sometimes due to substandard composition or old material. Joint leaks that allow water to flow into the space surrounding the connection of two pipes. Roots invading the sewer lines, which prevent normal cleaning and cause damage to the pipe. Sewer piping that is out of alignment because of shifting soil, frozen ground or settling. Location/evidence of a blockage due to the accumulation of grease or the presence of a foreign object. A home inspection when purchasing a new home gives the buyers confidence in the condition of their home. As essential as plumbing is to any home, we recommend more than a cursory glance by the inspector. Using our video inspection technology, we can see existing problems in the homes main sewer. We can identify corrosion, cracks, blockages and leaks quickly and accurately as well as any sections of pipe where a collapse is in progress. If the residence is in an area of weather extremes, this may cause ground shifting. Pipes can sink, crack or belly as the result of shifting or freezing. A video inspection of your home purchase can reveal any of these underground issues. The use of video inspection technology can help locate blockages in sewer pipelines. At times, roots from bushes, trees and other vegetation will work into the segment joints and break them apart. Pipeline video inspection allows virtual travel through the pipe to determine the condition through non-destructive diagnosis. Master Plumbing & Mechanical services the Washington, D.C. metropolitan area. Contact us for a video diagnosis of your home’s plumbing systems.